We love Fall and Halloween themed children's books and doing book related crafts and activities before/after we read! One of the main reasons I love working in my son's preschool classroom is because I learn so many things! Last Thursday I was assigned to the Library... so basically I spend the hour choice time exploring books with kids who wanted to read. What a rough day, right? ;) The book that I ended up reading about 15 times was The Little Old Lady Who Was Not Afraid of Anything by Linda D. Williams. This is NOT a book to read when you are supposed to be quiet (like in church) because it is loud and gets your whole body moving. We love it! 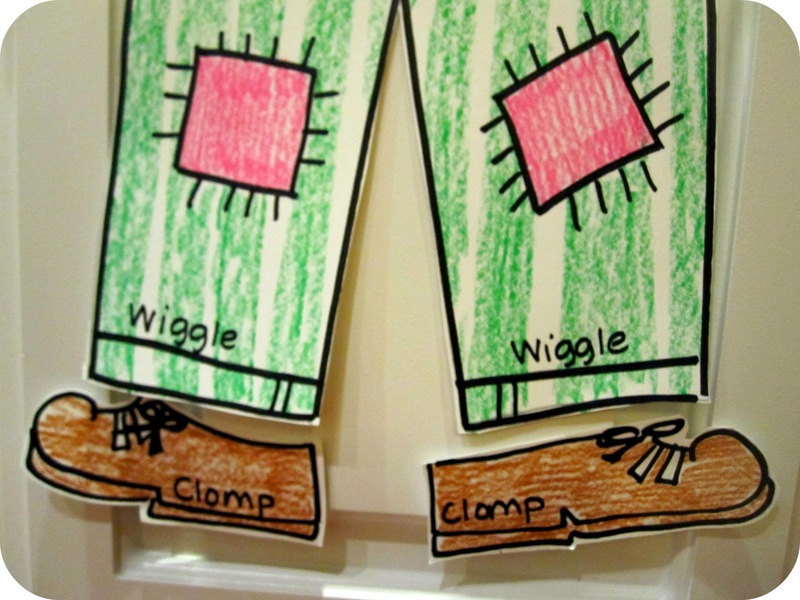 Yesterday I pinned a darling sequencing activity from I Can Teach My Child that goes right along with the book and then decided that we should make our own Little Old Lady Who Wasn't Afraid of Anything book themed puzzle. I started off by drawing all of the pieces to the story and writing the action words on each piece (see above). Then we colored the pieces. You can download the pieces that I drew on Google docs (there are 4 pages). Click on the links below. You just have to color them yourself. I stuck all of the puzzle pieces on the bottom of the wall with tape in the big clump. Then we got started reading the book together. 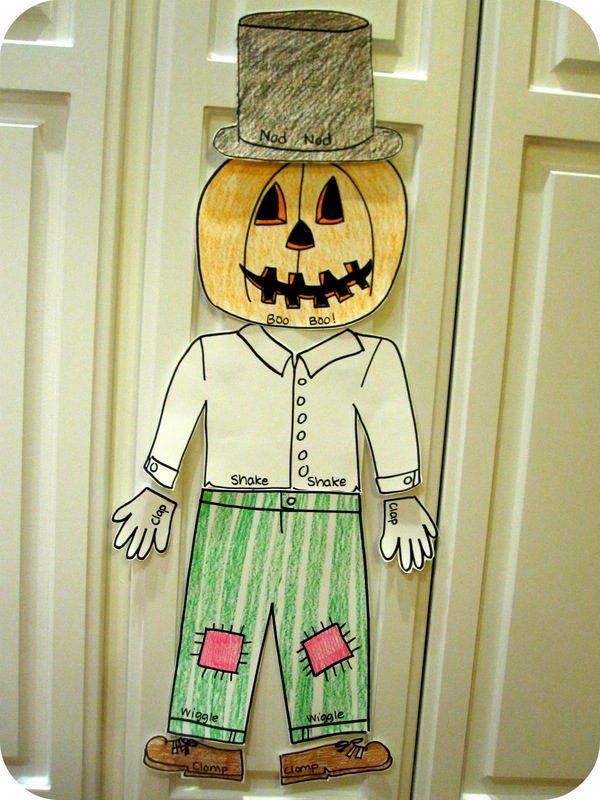 As we did the actions and read... my little guy stuck each piece on the wall in sequence until we had created our very own pumpkin scarecrow. We talked about the action words while we read. Moving, reading, and talking all at the same time is a pretty awesome way to read a story. - wondering about why the little old lady was in the forest, what was going to happen to all of the pieces, and how the little old lady was so brave! Do you have any other fun activities or crafts you have done or would do along with this book? We act this out with actual old clothes, boots,a hat, and a plastic pumpkin head. Each child get a different piece of clothing to flap and at the end they lay them all on the floor to make the scarecrow! It has been a favorite during our party day. we love this book & I am thankful for the printable pages! We will be using them! Thank you so much for linking to last week's Sunday Showcase! can't wait to see you share some more ideas on this week's linky - now open! Just found you on Pinterest! 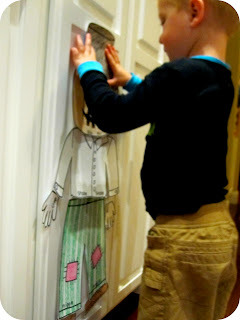 I'm a speech pathologist and a mama and just blogged about this book as well, but I LOVE your big drawings! I hope you don't mind, I plan to add this as a link on my own blog post! Adorable! love the idea - Can you tell me if there is a template for the patterns? Hi Ann yes the templates are linked above where it says "you can download the pieces that I drew on our scribe page" just click on the word scribd and it will take you to the PDF file. Enjoy! 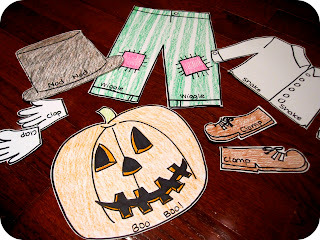 http://littlemissglamourgoestokindergarten.blogspot.com & search under fall! when I click the scribd link this activity isn't there?? I love this book~another resource for prinatbles for a flannel board is found at Kizclub.com, click on "storys and props"
Did this activity with my classroom and they loved it. After we read the story and my students helped put the scarecrow together by following along, they each got to then make their own that we displayed in the classroom for parents to see. This is adorable! Any chance it's still available? I've tried the links in the post as well as the direct links and neither are working. Thank you! Amanda there are four pages. If you look in the post it says Page 1 Page 2 Page 3 Page 4. Click on each link (hyperlinked to the words) and you'll be taken straight to each image. Download the images and print. If you are still having trouble, email me at toddlerapproved@gmail.com. The links in the post lead to Google docs that work fine when I click on them. Make sure you sign in using your google account and they should work.